Having celebrated over 30 years in this industry, we are proud to say that at Evergreen Office Supplies we are now Greener than ever! With it is becoming ever increasingly important for businesses to be environmentally responsible, we pride ourselves on offering environmentally friendly options in all avenues of our business and would welcome the opportunity to quote on “Green” alternatives; from everything from your normal, everyday office product right on through to a recycling programme for empty cartridges and mobile phones. From books and pads, cleaning and washroom products, computer accessories, office machines and even office furniture, we have environmentally friendly options. All the way through to catering products, we offer Fairtrade tea, coffee and chocolate. For ink and toner, we offer high-quality, remanufactured cartridges from a variety of suppliers; allowing for all of the reliability, for a fraction of the cost. All we need is the details of your office printers to quote you on how you can save money whilst helping the environment. We have a specially designed recycling programme for empty cartridges and mobile phones to provide an environmental solution from start to finish! 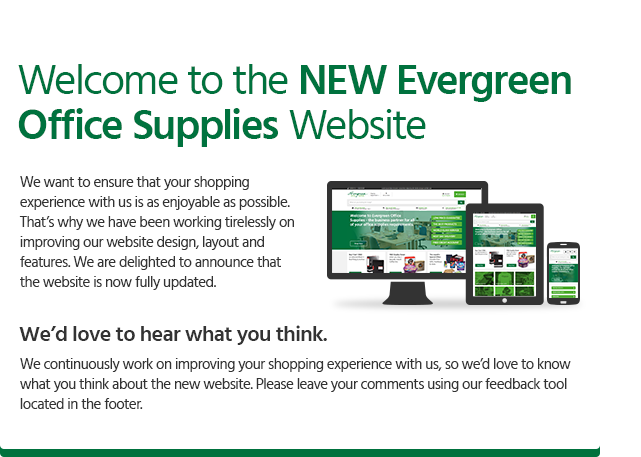 So, if, like us, you want to be for Evergreen – visit out online shop or contact us now!